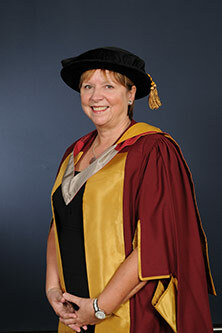 Professor Dame Wendy Hall is honoured at the graduation ceremony of the School of Informatics. City University London has conferred an Honorary Doctorate on Professor Dame Wendy Hall, Professor of Computing at the University of Southampton, and distinguished alumna, during its graduation ceremony on Monday 29th April 2013. Professor Dame Hall has made an outstanding contribution to the now ubiquitous fields of computing, the Internet and the World Wide Web. It was Dame Wendy's team of academics who invented the award-winning Microcosm hypermedia system in 1989, an early forerunner of the World Wide Web. Professor Paul Curran, Vice-Chancellor of City University London, said: "Professor Dame Wendy Hall has helped to transform the boundaries and capabilities of the Internet and the World Wide Web. Though she has spent most of her academic life at the University of Southampton, we can justly claim her as one of ours: she earned her Master's degree at City." Wendy Hall was born in West London and was the first member of her family to go to university. She gained an undergraduate degree and a PhD from the University of Southampton, and, in 1986, a Masters in Computer Science at City. She joined the then-fledgling Computer Science Group at the University of Southampton to begin her academic career. Her computing research began with pioneering work in multimedia and hypermedia, both infant disciplines at the time. Professor Dame Hall's primary research interest is in the area of Web Science. This considers not just the technology itself but the way in which it is used and how it will impact society in the future. In 2006, she co-founded the Web Science Research Initiative alongside Professor Sir Tim Berners-Lee, Professor Nigel Shadbolt and Daniel J. Weitzner. In 1994, she was appointed the University of Southampton's first female professor of engineering and has since become a prominent figure in promoting greater opportunities for women in science, engineering and technology. Professor Dame Hall is a Fellow of the British Computer Society and a Fellow of the Institute of Engineering and Technology. In 2002 she was made a Fellow of the City and Guilds and in July 2008, she was elected President of the Association of Computing Machinery - the first from outside North America to be elected to the role in the Association's long history. She became a Dame Commander of the British Empire in the 2009 New Year's Honours list and was elected a Fellow of the Royal Society in the same year. Professor Ken Grattan, Dean of the City Graduate School who nominated Dame Wendy Hall for the award, said: "Dame Wendy Hall has truly influenced the world as we know it today. Her ground-breaking work in the 1980s helped to give the birth to the World Wide Web. Her research, alongside Professor Sir Tim Berners-Lee, Professor Nigel Shadbolt and Daniel J. Weitzner in the Web Science Research Initiative continues to throw up exciting possibilities for the further development of the Internet. She is also particularly prominent as a strong and vocal advocate for women's opportunities in science, engineering and technology (SET). We are extremely proud that she is a distinguished alumna of City." City awarded degrees to more than 500 students at this week's ceremonies. They will join more than 130,000 alumni from City University London, which is ranked in the top 10 in the UK for both graduate-level jobs (The Sunday Times University Guide 2013) and starting salaries (Which University?). Destinations for graduates from the School of Engineering & Mathematical Sciences include globally recognised organisations such as Rolls Royce, Amazon, Airbus and Ernst & Young.